I am a huge fan of the Nacho Burger at Buffalo Wild Wings, so today I decided my own Nacho Burger that was so good, I had to call it the Macho Nacho Burger! Slather some Famous Daves Devils Spit BBQ Sauce on your party while grilling, or any other BBQ sauce of your choice. Melt some pepper jack cheese on top. 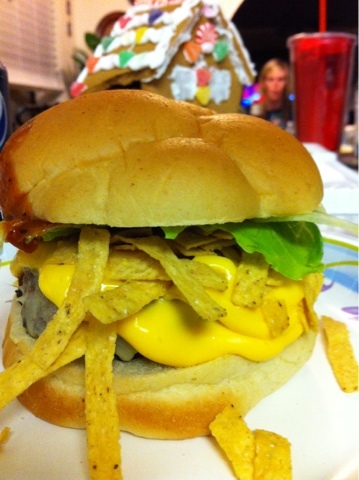 Put a few spoonfuls of nacho cheese on top of your burger. Add tortilla strips, jalapeños, and lettuce. Maybe a little onion and tomato as well! Top it off with some BBQ sauce, not too much and BOOM! There you have it! Free Gross Burger King Fries Today! What the Hell is a "McGangBang"